For easiest ordering, use our convenient on-line shopping cart system. It's easy, simple, and it uses the latest in secure Internet ordering with your major credit card or check by PayPal - one of the most trusted E-commerce credit card networks. If you prefer simply call toll free at 1-855-55-EPEST (37378) during business hours (9:00 am to 5:00 pm Monday through Friday CT). For fastest service, please have your VISA, Master Card, American Express, or Discover credit card number ready when you call. We cannot accept C.O.D. orders. If you prefer to mail in your payment, please enclose a check or money order for the full purchase amount a your order will ship in about 2 weeks or when the funds clear. Please, do not send cash. You can also fax us your order to 1-866-803-7378. Be sure to include your name, shipping address and Visa, Master Card, Discover or American Express number and expiration date. Your order will be processed as soon as we receive it. UPS and Fedex pickup at our warehouse at approximately 4:00 pm CT. If we receive your order prior to 3:00pm, and if it is in stock, then it will be shipped that day. When you see on item that you would like to order, simply point and click the Add To Cart button.Our shopping cart system then automatically takes you to that items page where all the available information about that item is stored. If you are sure that you want to purchase that item, then click the Add To Cart button again. That item is then stored in your online shopping cart. The online shopping cart is very similar to a regular shopping cart in your supermarket. Your online or "virtual" shopping cart holds all of the products that you have chosen until you are ready to check out. When your shopping cart appears, you can either remove your items, recalculate your order or continue shopping by pointing and clicking the Shop More button.If you are ready to check out, proceed directly to the check out counter by pointing and clicking the Checkout button. You can choose to pay with Paypal or you can choose to pay with regular credit cards or electronic checks. At this point you will need to fill out the order form. Please make sure that you double check everything, especially your shipping address. When you have completely filled out the order form, and everything is double checked, you then point and click the Checkoutbutton. At any time you can view the contents of your virtual shopping cart by pointing and clicking on the Shopping Cart link located at the top and bottom of each page.If you are ready to check out at any time simply point and click on the Check Out link located at the top and bottom of each page. That's it ! Your order is sent to us electronically, and you will receive an email confirmation about your order. And your order will be shipped the same day if it is received before 4:00pm CST. Free Standard Shipping means that ePestSupply will ship the package at our discretion. Orders under 10 lbs are generally shipped by United States Postal Service Priority Mail. Orders over 10 lbs are generally shipped by UPS or Fedex Ground. This is not always the case, and our chosen method can depend on the type of product (ORM-D) and size and weight as well as cost. Outbound shipping charges are included in the cost of the order. SmartPost and SurePost are pickup services provided by UPS and Fedex. USPS will deliver SmartPost and SurePost packages to the final destination. This service allows delivery to PO Boxes, and Military APO and FPO destinations. SmartPost and SurePost are also available for Alaska, Hawaii and US Territories. Regular shipping charges apply to these areas. Some oversize products may be charged an additional shipping fee due to oversize packaging. This fee is plainly stated on each items shopping cart page. Returns and Money Back Guarantees will be refunded the full purchase price. See return policy below for more information. Free Shipping does not include delivery outside of the lower 48 United States. By placing your order with ePestSupply, and unless otherwise specified, you are agreeing to what is called a "doorstep dropoff" which means that if no one is available to receive your shipment, it will be left at your doorstep unless you specifically request a different shipping destination. 1) Check all doorways, entrances, garage, etc. Also check behind shrubs and other hidden areas. 2) Check with neighbors and see if they received it. 3) Call your nearest Fedex, UPS or USPS office and ask to verify your shipping address. 4) Ask if your package is still on the delivery truck and when the expected delivery date is. What I think my package is stolen? If your package was delivered and cannot be found, within 7 days of the delivery date you must contact ePestSupply and notify us that the package cannot be found. ePestSupply will then contact the shipping carrier to verify all available information. If the package was delivered and all address information is correct, and the package cannot be found, then within 7 days of delivery date, a police report must be filed with your local police. A copy of this report must be sent to ePestSupply within 20 days of the delivery date. This is in accordance with PayPal Credit Card merchant policies. A determination will be made by PayPal as to the course of action. ePestSupply does not automatically re-ship or refund stolen packages and assumes no responsiblity. There is no exception to this policy. 1. Do not have any packages shipped to your home if you are not going to be there. 2. Have packages shipped to your place of work or business where you can receive them. 3. Do not leave any packages unattended on your doorstep, porch or with people that you do not know. 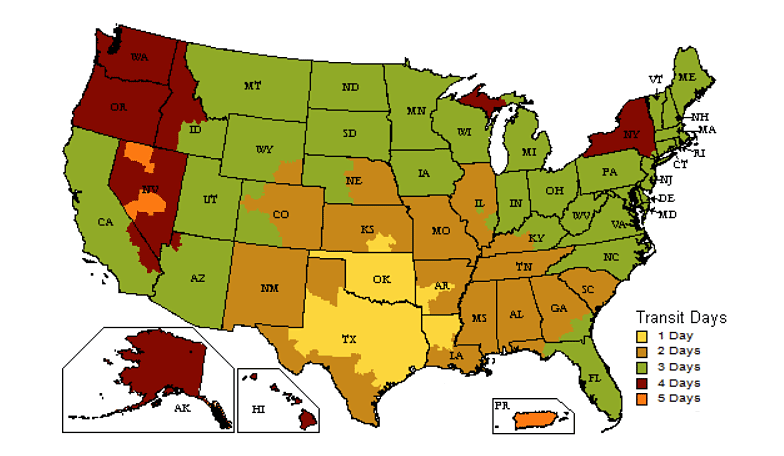 If your order is shipped UPS Ground, most areas of the Continental USA are served within 3 business days. Texas and immediate surrounding areas are served within 2 business days. All other areas up to 4 business days. Parts of Alaska and Hawaii are up to 5 business days. All merchandise is shipped directly from our fulfillment center in Dallas, Texas and in-stock orders usually ship the same day. Weekend and holiday orders are shipped the next business day. Due to the high demand of some products, we may not have your entire order available for same day shipment. If any part of your order cannot be shipped, we will contact you. In most cases we can ship the in-stock items and ship the remainder when it becomes available. When placing your order online, your credit card or paypal account places a hold on the funds by Paypal. When your order ships, the funds are then released to us. In some situations, the funds may be drafted in advance. If we cannot ship your order within 3 days, we will notify you with an update of your order delivery status and the option to cancel and credit your charges back to your credit card or PayPal account. For your protection as well as ours, on certain orders, especially large orders over $250.00, signature confirmation may be requested to receive your order. Guaranteed Delivery is available by calling us toll free at 1-855-553-7378 before your order ships. International orders and orders to Hawaii, Alaska, Puerto Rico, US Marshall Islands or any other US territory or state will be shipped via USPS, UPS or Fedex. USPS delivery fees to these areas are generally more economical than UPS or Fedex. If you are interested in shipping costs for these services, we will calculate the shipping charges for you. Simply go to our ask a pro page and click on the email link to send us your information. ePestSupply reserves the right to increase or decrease shipping fees and will work to find the most economical means of delivery available. Special attention will be given to any order that is outside of the continental United States. For international orders, we offer UPS, Fedex Worldwide Express and several International shipping and freight forwarding services. Shipping costs for these services cannot be automatically calculated by our shopping cart system. If you are an international customer and want to place an order, please contact us for shipping rates. We will be happy to assist you. In most cases, USPS is the preferred International shipping method. The charges generally are less and the delivery time is the same. For shipping costs for these services please e-mail your request or fax your request to 1-866-803-7378. ePestSupply will prepare a quote for your merchandise complete with shipping charges and estimated delivery times. Shipping charges are based on weight, dimensional weight and destination. Point of origination is Dallas, Texas USA zip code 75238. Customers are responsible for all duties and taxes that apply to international shipments. International orders must be paid in U.S. funds and ePestSupply must have a signed order confirmation prior to shipping. We will refund your full purchase price up to 60 days after purchase! Didn't use or don't like what you purchased and want to get your money back? No Problem. ePestSupply offers a 60 Day No Hassle Return Policy. Simply return the product to us postage paid within 60 days of purchase and we will refund your full purchase price. If your merchandise is defective or damaged upon delivery, please contact us immediately at 1-855-55-EPEST (37378) . Credit card refunds are issued immediately upon receipt of the returned item. Please allow up to 15 days for refund checks if you have paid by check or echeck. Refunds can also be issued through Paypal if you have a Paypal account. Products containing foil or foam seals that have been opened or removed are not returnable. Products that have been used are not returnable unless that product has a printed guarantee on the product packaging or item page. Orders are non-refundable after 60 days. Qualifying returns may be exchanged for full credit towards other products. ePestSupply guarantees that our products are of professional and/or retail quality, and that they are "as described" on the product information page. The results you obtain from using any product are directly related to how that product is mixed and applied. If you follow the label directions, and use proper application and/or use techniques, you can expect to get satisfactory results. Most pest infestations are the result of the pest laying eggs, birthing young, and propagating over a period of time. Total elimination of most pest infestations will not happen with 1 treatment or application and usually require repeated treatments to overcome the "birthing cycle", stop the "egg laying process", etc. This is why professional pest control companies offer a treatment program that consists of an initial and follow-up treatments to totally eliminate pest infestations. There is no guarantee that the product you purchase will eliminate all pests or pest infestations. 100% Money Back Guarantee orders will be refunded the purchase price of the product less outbound shipping costs. Free shipping terms mean that shipping charges are included in the total cost of the order. See FREE SHIPPING TERMS for more information. ePestSupply guarantees that if you find the price cheaper at any online retail website*, including shipping charges, we will match the price or in some cases, beat it. Our prices include shipping, and are the final price that you pay. ePestSupply does not match prices with eBay, Amazon, or any discount or wholesale site. ePestSupply also does not match prices on products that are special order, closeouts, seconds, refurbishments, scratch and dent, or seasonal. All prices must include shipping costs as a final price. All price matches are at the final discretion of ePestSupply. Texas law requires that we collect 8.25% state and local tax on all merchandise shipped to addresses within the State of Texas. As an added convenience, ePestSupply offers check payments by through Paypal®. This method of payment allows customers to pay with a regular checking account that is drawn on a US Bank. When processing your payment by regular check, Paypal captures the bank routing number and the account number and encrypts this information. A hold for the funds is then placed on ePestSupply's account with Paypal until the funds clear. Paypal then notifies us when your payment is clear and that the order is approved for shipping. The average amount of time that this takes is 10-14 business days.When the funds are released by Paypal, we will process your order and notifiy you that your order has shipped. ePestSupply will not automatically notify you of the status of your order unless the funds have been declined. In the event the funds have been declined, we will contact you and try to arrange another form of payment. For fastest processing, payments for orders can be made with a regular credit or debit card either over the phone or online. We strive for top customer service. All of our specialists are here to serve you in a fast expedited manner and to your complete and total satisfaction. 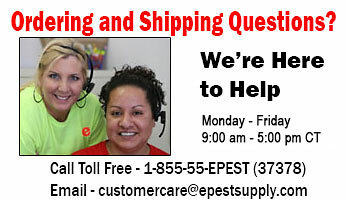 If you need assistance with your order or have questions, please email us at customercare@epestsupply.com or call us Toll Free at 1-855-55-EPEST. Please call between 9 am and 5 pm, Central time, Monday through Friday. Emails will be answered during normal business hours. If your email is received after hours, it will be answered the next business day.If you are not totally satisfied with us in any way, please contact Ron Dawson, President and CEO Toll Free at 1-855-55-EPEST (37378). So that our employees may spend holidays with their families, our phones will not be staffed on New Year's Day, Easter, Memorial Day, 4th of July, Labor Day, Thanksgiving and Christmas.